Adding healthy years to human lives through research, education and inspiration. Over the past 25 years, as an educator and scientist, my goal has been to inspire my students, family, friends and my community to live healthy lives. I truly believe that scientific work should not stop in the lab and only appear in scientific publications. As a scientist and a professor in the largest public university system in the world, University of California, I feel responsible to share facts and to separate them from hypes. I feel privileged to have a career that allows me to interact with young minds, to learn from them, and to be inspired by them. I grew up in a family with supportive parents and grandparents who taught me at a very young age the value of education, service, giving back to the community, and the importance of equality of the sexes. They also raised me to be independent, outspoken, and to strive to have a purposeful life. I was born in Iran and lived there until I was about 15 years old. As a young woman, I witnessed a revolution and the cruelties of war, and developed a strong sense of social justice and helping people in need. One day, my parents told me to pack one suitcase. We immigrated to France where I completed high school while learning French. In a TEDx talk titled “what if” I have shared a glimpse of how it felt to start high school in France without speaking the language. Adopting a joie de vivre mentality was easy because I fell in love with the French culture, food and style of living. I grew up in a family with supportive parents and grandparents who taught me at a very young age the value of education, service, giving back to the community, and the importance of equality of the sexes. They also raised me to be independent, outspoken, and to strive to have a purposeful life. I was born in Iran and lived there until I was about 15 years old. As a young woman, I witnessed a revolution and the cruelties of war, and developed a strong sense of social justice and helping people in need. One day, my parents told me to pack one suite case. I still remember my last night in our home in Tehran. I could not sleep. I walked around my room, our home and garden knowing that these would be my last hours in this home. I graduated from Lycee Masena and registered at the College of Pharmacy at the Chatney University in Paris. But my parents decided that it was time to move to America. We moved to California and I had to learn English while attending college. I remember that for one of my college applications I had to take some written tests. On the biology test, I knew the answers but I did not know how to write them in English so I wrote them in French! I learned about UCSF and its #1 ranking as a Pharmacy School so my dream was to go to the UCSF School of Pharmacy. I graduated from UCSF in 1994 and also completed a residency program at UCSF. 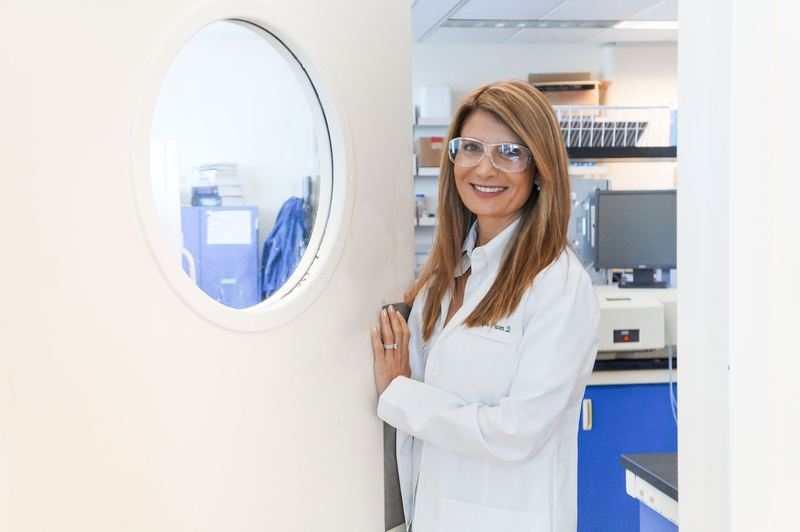 Over the past 25 years as an educator, scientist, and administrator, I have worked as a professor in academic institutions such as UCSF and UCI and as a senior research scientist and regional scientific manager at Abbott Laboratories. Until 2005, the focus of my research and clinical work was on the pharmacotherapy of cardiovascular diseases and dyslipidemia. I developed and directed the Cholesterol Clinic and co-developed a Cardiovascular Risk Reduction Program at UCI Medical Center. My interest in teaching started in elementary school but the real epiphany happened in my undergraduate years when I worked as a tutor. My most challenging student was Sok, a Cambodian student with cerebral palsy who was determined to finish college. I helped him with his mathematics and physics courses and he in turn taught me that every student had the potential to succeed. Sok won the 1st place in the Special Olympics during his last year of college and gave me his plaque as a thank you gift. I still have that plaque in my office that still inspires me. In 2005, I was recruited back to UCI to develop an undergraduate degree in Pharmaceutical Sciences with the goal of enhancing pre-pharmacy education. In this new position, I shifted the focus of my research from clinical and drug studies to evaluating the impact of dietary supplements and natural products on aging and health. In my laboratory, we use human cultured cells, fruit flies and mice as our model systems to identify compounds and botanicals that increase lifespan and improve healthspan. The main focus of my research is to add healthy years to human life through a science that I introduced as Healthspan Pharmacology. One of the main reasons that I left Abbott Laboratories and came back to UCI was that I missed classroom teaching and mentoring students. I currently teach two courses at UCI, Molecular Pharmacology and Life 101. I want my students to become lifelong learners, to think critically, and to choose a career that they are passionate about. I feel privileged to have a career that allows me to interact with young minds, to learn from them, and to be inspired by them. I received my doctorate in Pharmacy, Pharm.D., from UCSF in 1994 and subsequently completed a residency in pharmacy practice at UCSF. I am currently Professor and Vice Chair of the Department of Pharmaceutical Sciences at UCI. The focus of my current research program is on slowing the aging process through a science that I introduced as Healthspan Pharmacology. Using human cultured cells, fruit flies, and mice I study the impact of botanical extracts and dietary supplements on aging. My ultimate goal is to slow the aging process and add healthy years to human life. I developed this research program through an evolutionary process that took me almost 25 years. As a clinical researcher in academia, the general focus of my research was on the efficacy and toxicity of cardiovascular and anti-dyslipidemia drugs and precision of point-of-care cholesterol testing devices. At Abbott Laboratories, I first worked as a research scientist in the Neuroscience Group focusing on the metabolic complications of Abbott’s blockbuster seizure and migraine headache drug, Depakote (divalproex sodium) and then I moved to the metabolic group focusing on immunomodulation properties of Abbott’s oral vitamin D analogue, Zemplar. After one year, I was promoted to a senior research scientist position and presented my work at various national and international conferences. In 2003, I became the Regional Medical Scientific Manager and managed a team of 10 talented Ph.D.s, MDs, and PharmDs. In 2005, I was recruited to UCI to develop the new major in pharmaceutical sciences. This new position gave me the opportunity to shift the focus of my research from diseases of aging to slowing the aging process. Using Drosophila as my main model system, I established a basic science research program focusing on the impact of pharmacological interventions (dietary supplements and botanical extracts) on lifespan and healthspan. Aging is a complex and multi-factorial process that is reflected in all the changes that occur during our lifespan. Aging can be characterized as a decline or loss of adaptation, progressive accumulation of cellular damage and a degradation of repair and maintenance mechanisms. These lead to a gradual deterioration of physiological functions that will result in diseases of aging such as cancer, Alzheimer’s disease, and cardiovascular diseases. Over recent decades, improvements in medical diagnostics and procedures, as well as improvements in hygiene, have resulted in a steady increase in human lifespan, but this increase has unfortunately been accompanied by ever-growing occurrences of diseases of aging. Therefore, understanding the mechanisms of aging, defining the most important risk factors for the development of chronic diseases of aging, and identifying safe interventions to ameliorate the aging process are more important today than ever. Aging is a complex and multi-factorial process and it can be slowed and ameliorated through multi-factorial interventions that would include safe pharmacological interventions (i.e., natural products, botanical extracts and dietary supplements) and non-pharmacological interventions (i.e., exercise, nutrition, stress management). Healthspan is a holistic measure of an organism’s life, encompassing not only lifespan but also other factors that more clearly define its state of health. In other words, it is the span of time an organism stays healthy, not just alive. Since humans live too long, we use animal model systems to study lifespan and healthspan. For instance, we evaluate physiological functions such as locomotor activity, cognitive ability, and reproductive fitness in fruit flies to evaluate the impact of various interventions on healthspan. We can then extrapolate our findings to human studies. The main goal of Healthspan Pharmacology is to discover natural and safe interventions that lengthen an organism’s lifespan without decreasing its quality of life. Since 2005, we have been assaying pharmaceuticals and natural products for their anti-aging capabilities. We have identified 5 plant extracts and natural products that extended lifespan and improved healthspan: Rhodiola rosea, Rosa damascenca, curcumin, cinnamon, and Angelica keiskei. We have also evaluated the anti-aging mechanism of these plants. I am very proud and excited by these findings, which have laid the groundwork for ongoing studies in mice and ultimately for human clinical trials. We are hoping that these studies will close the large gaps in human knowledge about the mechanisms through which these natural products modulate aging. Our research hopes to bridge that gap and elucidate how botanical extracts and dietary supplements affect the human body at a molecular level. The fruit fly is a well-established model system to study aging, and for good reasons. Its relatively short lifespan allows quick assaying of anti-aging interventions. More importantly, fruit flies share about 75% of disease genes with humans, and about 50% of their protein sequences have mammalian homologues. Fruit fly models of human disease allow us to perform whole-organism studies and investigate many different aspects of physiology. These experiments serve as the necessary stepping stone to larger mammalian or clinical studies. The Golden Root or Rhodiola rosea has been traditionally used for its adaptogenic ability to relieve stress and fatigue and improve mental and physical health. In 2007, we were the first lab to report and publish that Rhodiola rosea increased mean lifespan of fruit flies by 25% while improving their healthspan. After our publication, other labs reported lifespan extension properties in worm and yeast models suggesting that the lifespan extension with this plant is conserved among model species. However, its molecular mechanism of action remains unclear. We continue to perform studies using Rhodiola rosea in hopes of uncovering specifically how it delays the rate of aging, and how it can be used to remedy various age-related diseases. The impact of Rhodiola rosea on the gut microbial community of Drosophila melanogaster. Life101 Enhances Healthy Lifestyle Choices in Undergraduate Students. Stress levels in college students are increasing at an alarmingly fast pace. To combat this rising tide, universities need effective tools to promote student’s well-being and help them to recognize and manage their stress. One approach is to teach students basic lifestyle skills to cope with stress and achieve wellness. This is important as it not only increases students’ retention within a chosen field of study, but assists them to achieve personal and academic success. To inspire our undergraduate students to adopt healthy lifestyle choices, I developed a once-weekly course titled “Life101” with topics that focused on students’ wellness such as stress management, nutrition, exercise, emotional intelligence, and financial management. I teach the course through a combination of lectures, multimedia videos, and discussions. In a recent publication titled, “Life101 Enhances Healthy Lifestyle Choices in Pre-Health Undergraduate Students”, I reported that that Life101 had a significant positive impact on the lifestyle of our undergraduate students. I strongly believe that offering Life101 to undergraduate students can serve to improve their mental and physical health. Both in-class and online courses resulted in positive lifestyle changes in our students. Online students showed greater mastery of course topics compared to their in-class peers. Long-term benefits from the course were reported after a one-year follow-up. Although, this collective positive impact may suggest that offering Life101 to undergraduate students can serve to improve students’ mental and physical health, a prospective study is needed to confirm these findings. In this book, Dr. Mahtab Jafari examines the Dietary Supplement industry and its regulation (or lack thereof), the marketing practices, the gap in science, and the safety issues associated with the supplements. She also makes recommendations on how to select the right dietary supplement(s) and how to monitor them to assure safety. The Science Studio: A Conversation with Mahtab Jafari. Botanicals and the Pathway of Aging. Feel free to contact me by filling out the form below. Choose the area of your interest and I will be happy to get back to you.